Pickup from Delhi Railway Station/Airport, drive to Hardwar. Check in Hotel. Local Sight Seeing. In the evening visit Ganga Aarti at Har-ki-Pauri. Dinner & Overnight stay at Hotel. After Breakfast, visit Hardwar city tour & temples i.e. Mansa Devi Temple, Chandi Devi Temple, Bharat Mata Mandir, Bhooma Niketan, Daksh Temple, Bilkeshwar Mahadev Temple, Vaishno Devi Temple, Sai Baba Temple. Later arrive back to Hotel. Dinner & overnight stay. After breakfast, drive to Mussoorie. Mussoorie is a fascinating Hill Resort commanding a wonderful view of the extensive Himalayan range and at night the glittering views of Doon Valley. Ever since 1823 AD., when Capt. Young of the British Army, over whelmed by the natural beauty of the wooden ridge, laid the nucleus, Mussoorie has developed into one of the most popular summer destinations in the northern hills. 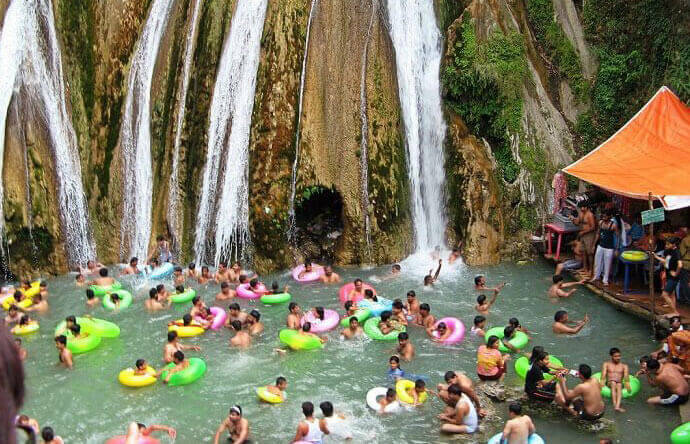 Mussoorie is called “Queen Of Hills” today it is one of the most popular summer destination in the northern hills. Check in Hotel. Dinner & Overnight stay at Hotel. Visit Full day local sightseeing i.e. Kempty Fall, Mussoorie Lake, Camel’s Back Road, Gun Hill, Sir George Everest House, Children Lodge etc. Dinner & Overnight stay at Hotel. After breakfast, drive to Rishikesh – The ‘place of sages’ is a celebrated spiritual town on the bank of Ganga and is surrounded by Shivalik range of the Himalayas on three sides. It is said that when Raibhya Rishi did hard penances, God appeared by the name of “Hrishikesh” and this area hence firth came to be known as Rishikesh. Check in Hotel. Later visit Rishikesh Local Sightseeing & temples. At evening visit Parmarth Niketan for Ganga Aarti. Dinner & overnight stay at Hotel.